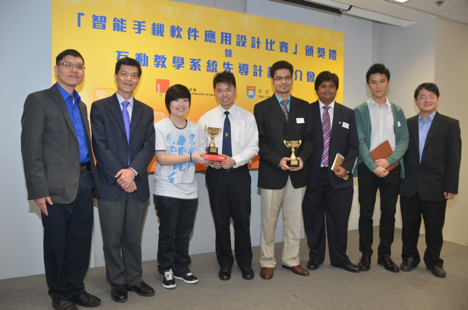 A group of 5 EEE students including Mr. Ralph Long-Fung Cheung (EComE Graduate 2010), Mr. Kshitij Tiwari (EComE Year-2), Mr. Shravan Sunderraman (EComE Year-3), Mr. Alexander Ho-Young Chan (InfoE Year-2) and Mr. Lu Nan (EEE MSc student) won the First Award in the Tertiary and Open sector of a Smartphone App Contest co-organized by the Hong Kong Federation of Youth Groups (HKFYG – 香港青年協會) and the Department of Electrical and Electronic Engineering, the University of Hong Kong, in a Knowledge Exchange Project. Their project entitled ” Serve Our Society (SOS)” was evolved out of a team with EEE students from different backgrounds and cultures, including Hong Kong, India, Singapore and P.R.C. Yet they have the unique goal of using the meaningful app to serve minority groups and voluntary organizations in our society through the promotion of voluntary social services. Their key idea is to promote some challenging voluntary work or those services in remote areas (with high HeartIndex) through earning “HeartCredit”. The “HeartCredit” may later be used to exchange for other items / services within the community of voluntary work. Another group of 2 students Mr. LIN TSZ NGAI (EComE-2) and Ms. Lui Sin Ying (CS-2) won the Best Innovation Award for their project “Make the Right Decision(人仔的抉擇)”. The EEE team and another team from HKU with Professor Y.S. Hung (Guest of Honor, Associate Dean of Engineering on Knowledge Exchange), Dr. Wilton Fok and Dr. Vincent Tam. Together with an iPhone App Training Workshop held in the last summer (May/2011), this Smartphone App Contest is part of a Faculty-based Knowledge Exchange project entitled “ Knowledge Exchange and competition on iPhone App”. Both the training workshop and smartphone app contest were co-organized by our EEE team including Dr. Vincent Tam, Dr. Wilton Fok and Dr. K.S. Lui, and the Hong Kong Federation of Youth Groups (HKFYG – 香港青年協會). The training workshop was offered freely to 10 secondary schools to provide basic knowledge on iPhone app development and programming. The Smartphone App Contest was divided into two sectors: 1) Secondary School sector; 2) Tertiary and Open sector to promote the use of smartphone apps for the healthy living of young people or help to minority groups.